Back up camera and TONS of storage space! This LS Trax has been well cared for. Engine, ECOTEC Turbo 1.4L Variable Valve Timing DOHC 4-cylinder sequential MFI (138 hp [102.9 kW] @ 4900 rpm, 148 lb-ft of torque [199.8 N-m] @ 1850 rpm), Rear Vision Camera Need more info? Text with us! @ 912-332-1972 or call 912-876-2121. 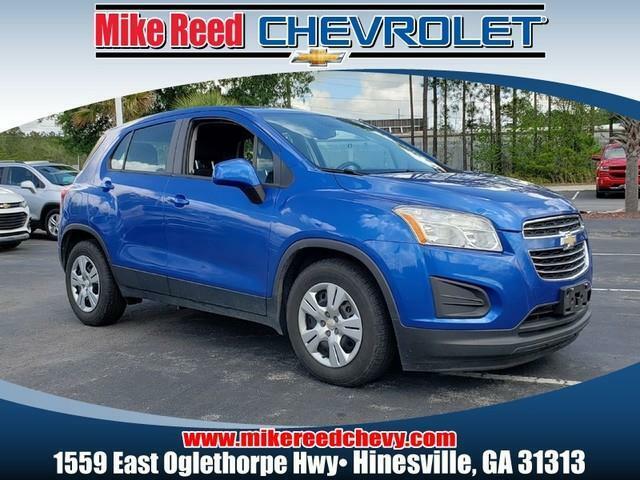 Savannah Chevrolet drivers, Mike Reed Chevrolet is your source for new and pre-owned cars, trucks and SUVs. We also provide our Hinesville and Richmond Hill Chevrolet shoppers with financing options. We have a great collection of new and pre-owned vehicles, and our inventory is always updated with the latest models. We offer competitive rates on car loans to help you buy the Chevy you need. Buy or lease a vehicle, check out our specials online, or place a quote today! Savannah Chevrolet customers, we have developed an excellent reputation for our pricing and services. Stop by today and our friendly staff will be glad to assist you! This LS Trax has a back up camera and power seat! ENGINE, ECOTEC TURBO 1.4L VARIABLE VALVE TIMING DOHC 4-CYLINDER SEQUENTIAL MFI Need more info? Text with us! @ 912-332-1972 or call 912-876-2121. Savannah Chevrolet drivers, Mike Reed Chevrolet is your source for new and pre-owned cars, trucks and SUVs. We also provide our Hinesville and Richmond Hill Chevrolet shoppers with financing options. We have a great collection of new and pre-owned vehicles, and our inventory is always updated with the latest models. We offer competitive rates on car loans to help you buy the Chevy you need. Buy or lease a vehicle, check out our specials online, or place a quote today! Savannah Chevrolet customers, we have developed an excellent reputation for our pricing and services. Stop by today and our friendly staff will be glad to assist you! This LS Trax was locally purchased, owned, driven and serviced! It is a NON-SMOKER and is ready for a new home! Wheels, 16" (40.6 cm) steel, Windshield, solar absorbing, Windshield, acoustic laminated, Audio system feature, 6-speaker system, Driver Information Center 3.5" monochrome display with True White back lighting and digital readouts, including speedometer, odometer, trip odometer and fuel gaugeENGINE, ECOTEC TURBO 1.4L VARIABLE VALVE TIMING DOHC 4-CYLINDER SEQUENTIAL MFINo Accidents! One Owner! Need more info? Text with us! @ 912-332-1972 or call 912-876-2121. 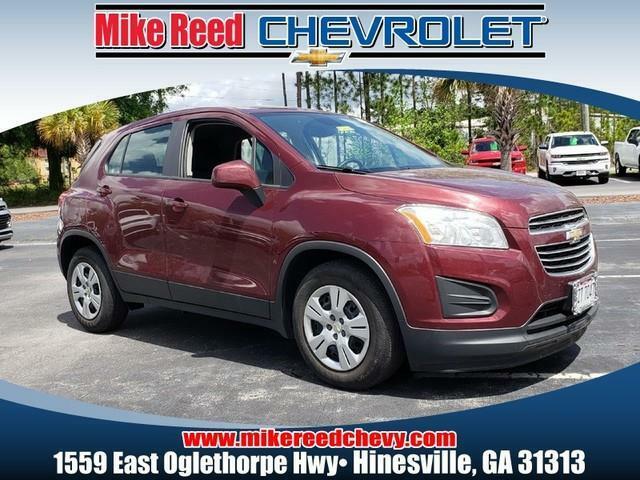 Savannah Chevrolet drivers, Mike Reed Chevrolet is your source for new and pre-owned cars, trucks and SUVs. We also provide our Hinesville and Richmond Hill Chevrolet shoppers with financing options. We have a great collection of new and pre-owned vehicles, and our inventory is always updated with the latest models. We offer competitive rates on car loans to help you buy the Chevy you need. Buy or lease a vehicle, check out our specials online, or place a quote today! Savannah Chevrolet customers, we have developed an excellent reputation for our pricing and services. Stop by today and our friendly staff will be glad to assist you!